When one chats to Shakespearean actor Michael Pennington, it’s easy to fall in love with his dulcet tones, you’d think it was hand crafted to speak the Bard’s work. And with a voice that can make the phone directory seem fascinating, it’s a good quality as he takes on the Shakespearean epic King Lear coming to the Royal and Derngate in Northampton. He has played numerous roles with the Royal Shakespeare Company in a career spanning more than 50 years and appeared in the Star Wars film and The Iron Lady. Michael plays the title role running from Friday 1st to Saturday April 23rd. He said: “I was reading an article in popular national newspaper and it was a poll of Shakespeare’s most popular plays and on top came King Lear which surprised me. The final night of the play is performed on the 400th anniversary of the Bard’s death and Michael believes despite its age, the material is still relevant to the times that we live in. Michael said: “It is about a King who is dividing his kingdom and sharing it with his three daughters. But it could just as easily be a CEO dividing his company up or the head of a family dividing up the estate. “Indeed there is a line in the show which makes you think of Calais and all the immigrants there. He also believes that the Bard’s work is starting to see a revival among a whole new generation. Michael said: “We get to see a lot of young people coming to see Shakespeare and in part I think it has come about because of the improved way it is taught in schools. It was probably a given that he was going to play King Lear at some point. Michael said: “ when you reach a certain age, you might be cast as Romeo, and then you get to the next age and you’ll be asked to play Hamlet and then after that, you get asked to be King Lear and I have reached that age. “It is that he could go from writing about ordinary conversation to the most beautiful poetic dialogue within seconds. There is no other writer that could do that. 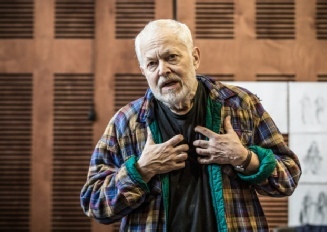 Michael has previously played the role in a production in New York and he was instrumental in aiming to bring a version of King Lear to Northampton. We spoke to Michael during rehearsals and while it has taken a long time to reach the stage, Michael is pleased with the end result. He said: “We are in rehearsals and they are going very well. I am the only cast member to come over from the New York show but it has been helpful to act as a guide to give the other cast members. But we are absolutely on the same wavelength. He is also full of praise for the team at Northampton who are responsible for putting on the show. Michael said:”I have performed a solo Shakespeare show about six or seven years ago and I did come and see the last production The Herbal Bed which was stunning. He has had a broad and varied theatre career and you might think it was a deliberate choice. However it seems to happened by accident. Michael said: “There isn’t a conscious decision to do more theatre work. I was offered a big film and Hamlet at the same time in 1980 and from that I had to make a decision and chose to do Hamlet. There are times like that when your preferences as an actor come out. One of the film roles he did take on was the relatively small part of Morff Jerjerrod in the sixth film of the science fiction saga Star Wars and he is amazed by the response it has had. Michael said:”Star Wars, I had a week working on that film. I saw it very recently and I don’t think I was very good in it. I wish I could have done it better.4”It was good fun but it wasn’t like working on the film for three months and you build a relationship with the cast. I came in and did my scenes.